Law Society of Scotland will remain in charge of Scotland’s legal services market despite Legal Services Bill ‘reforms’. CONSUMERS of legal services in Scotland may have to wait for some time before they see any real benefits from the Legal Services (Scotland) Bill, which finally completed its ‘Stage Two’ hearings at the Scottish Parliament today, seeing yet more amendments & capitulations by MSPs to the Law Society of Scotland, almost rendering the bill worthless in terms of achieving an increase in consumer protection from Scotland’s notoriously poor legal services market. Supporters of the Legal Services (Scotland) Bill, including the consumer organisation “Which?" have apparently praised the almost ‘momentous’ occasion of the Justice Committee voting through a proposal to allow external investors (non-lawyers) to own up to 49% of existing law firms, should of course, investors chose unwisely to invest in them. While some still spin out the Legal Services Bill as a major advance for consumers of legal services in Scotland, the fact is that the trail of amendments, many of which were requested and even authored by the Law Society itself, have made the Legal Services (Scotland) Bill almost worthless to the ordinary Scottish consumer, compared at least with the benefits enjoyed by English consumers as a result of the passage of the Legal Services Act in England & Wales over three years ago by the previous UK Government. The English version of the Legal Services Bill has already had the effect of creating a regulator, the Legal Ombudsman (LeO), which is so far enjoying favourable reports in the UK media over its ambitions & abilities to independently regulate the English legal services market. Even the Legal Complaints Service has made giant strides forward, compared with its Scottish Counterparts, currently the SLCC & Law Society of Scotland. Curiously, “Which?” the chief proponent of the Legal Services (Scotland) Bill, are now reluctant to answer questions as to why the organisation has not done more to protest against the watering down of the Scottish Legal Services Bill, which is now a third rate example of its English counterpart. Amazingly, for instance, little has been said about the fact consumers who lose out financially to dishonest legal representatives will, under the terms of the new Legal Services (Scotland) Bill, be forced to make a claim against the Law Society controlled “Guarantee Fund” – a compensation scheme run by the Law Society of Scotland to pay out client claims made against dishonest solicitors, but which is widely viewed by most who try to make a claim against it as being just as corrupt & protective of ‘crooked lawyers’ as the Law Society of Scotland’s infamous Master Policy, which a study by the Scottish Legal Complaints Commission last year linked to client suicides, information which was apparently covered up by the Law Society of Scotland for years. Unsurprisingly, the Law Society of Scotland welcomed the many changes & retreats to the Legal Services Bill the society had requested and also went on to praise the Legal Services Bill as guaranteeing the ‘independence of the legal profession’ – a well known Law Society phrase roughly translating to “We won again, phew”. The Law Society also welcomed the agreement at the Justice Committee today that ministers should not be able to influence the composition of the Law Society’s Council. However, to ensure that the functions of the Council and a new regulatory committee, established by section 93 of the bill, are kept separate (in other words, to create an illusion of transparency and laughable accountability within the Law Society) an amendment was also passed to make explicit that the Council should not interfere unduly in the regulatory committee's business. A proposal to set up a separate representative council was rejected. Jamie Millar, President of the Society said he was pleased that that the committee had backed the commitment (capitulation) expressed earlier this year by Communities Safety Minister Fergus Ewing to bring forward amendments to ensure independence of the profession. The Society also supported an amendment today to strengthen the Scottish Legal Aid Board's obligation to monitor the availability and accessibility of legal services in Scotland. It will require SLAB to take into account relevant factors, relating particularly to rural or urban areas, to ensure there is no detrimental impact on the public’s access to legal services. MSPs also agreed an amendment which at some future point would allow ministers to change the percentage of non-solicitors or regulated professional ownership of licensed legal services providers if necessary, however the Society believes that there needs to be a clearer specification under which ministers might act – so we can expect a summer filled of lawyers squabbling amongst themselves, with a resultant climb-down yet again from the Scottish Government when the Legal Services (Scotland) bill finally comes up for a vote. Mr Millar continued : “The requirement to consult the Lord President, the Society, all other approved regulators and the OFT before making regulations to amend or repeal the section on majority ownership, offers some reassurance. However we do have concerns that if Scottish ministers have free rein to alter the percentages, this uncertainty might be a disincentive to investors. There is also a lack of specification of the conditions under which Scottish ministers would exercise those powers. The Legal Services (Scotland) Bill originated from a ‘supercomplaint’ filed by consumer organisation Which? to the Office of Fair Trading in 2007, alleging lack of competition in Scotland’s solicitor only dominated legal services market. The Law Society of Scotland initially rejected the OFT’s call for an investigation into the Scottish lawyer monopolised legal services market. The SNP controlled Scottish Government joined the Law Society and initially rejected any idea of legal services reform then, after the legal profession decided it would be better to take the issue and control it themselves, Justice Secretary Kenny MacAskill ‘changed his mind’ and the Legal Profession Bill was created, and was renamed to the Legal Services (Scotland) Bill on the suggestion of .. yes, you guessed it, the Law Society of Scotland. Labels: Fergus Ewing, Kenny Macaskill, Law Society of Scotland, Legal Services Bill, Scottish Government, Which? Publish your complaint against your solicitor – help protect yourself, help protect all consumers of legal services in Scotland. Clients of solicitors & consumers of legal services in Scotland now have a chance to search for detailed complaints information on their lawyers & others in the legal services sector with the creation of the Scottish Legal Consumer Complaints web blog, a community based effort to publish free of charge, all complaints made against the legal profession, media reports on ‘crooked lawyers’ and client ratings of the legal services provided to them by Scots law firms. Scottish Legal Complaints Commission & Law Society of Scotland have failed to protect consumers. Lets not kid ourselves, the Scottish Legal Complaints Commission is more anti-consumer than consumer friendly .. a litany of reports have proved that, as board members and its senior officials indulge in hate fuelled anti-client rants while of course, picking up huge expenses claims for allowing the Law Society of Scotland yet another free hand at protecting ‘crooked lawyers’, ensuring droves of unsuspecting consumers end up using lawyers who may be facing 20 or more complaints & financial claims from other clients whose legal affairs have invariably been damaged beyond repair. Put it this way, would you want to use a solicitor from a law firm with over thirty partners which is currently facing 21 separate complaints investigations (5 of those involving embezzlement of client funds), 20 negligence claims, 9 claims against the Guarantee Fund & 2 criminal investigations ? You might be using such a solicitor right now and not even know it. It is now therefore time to skip the complaints confidentiality of the legal profession which protects rogue lawyers from public scrutiny, and publish all complaints information, so consumers can decide for themselves who best to represent their legal interests. Clients who have registered complaints against their solicitors should indicate whether or not they wish their own names published. If clients do not wish their names published, they will be referred to as "the client" and any identifying information or location details from material provided to us for publication will be removed. The solicitor's identity and the identity of their law firm will remain for all to see. Publication of complaints information may benefit consumers by adding public scrutiny to the actions of members of the legal profession who are the subject of complaints by clients. 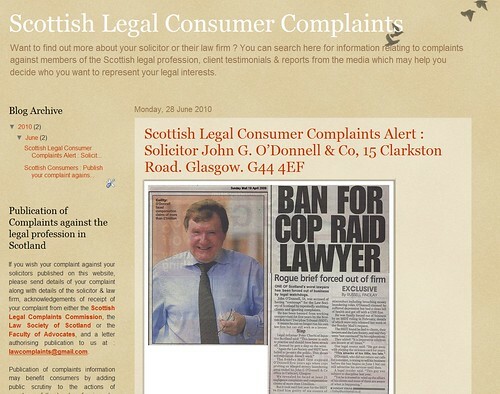 Scottish Legal Consumer Complaints is thankfully in no way affiliated to the Scottish Legal Complaints Commission, who carry no such register of complaints against solicitors nor will they disclose the regulatory records of solicitors to potential clients. Scottish Legal Consumer Complaints is a not for profit group and publishes all information submitted to it free of charge. Holyrood’s Justice Committee voted through latest Law Society edicts on Legal Services Bill. THE ROAD TO RUIN for Scots wider choice of access to justice provided by the Legal Services (Scotland) Bill, took a step closer this week as the Scottish Parliament’s Justice Committee voted through the latest series of Law Society led re-writes of what is now becoming a decidedly consumer unfriendly piece of legislation, with MSPs voting through little publicised amendments put forward by the Law Society itself which will force any non-Law Society controlled legal service provider in the new expanded legal services market forced to contribute to, and access the existing Law Society controlled & administered Guarantee Fund, with any individual claim on the fund to be capped at £1.25 million. The Scottish Government - so much money, so many civil servants, still couldn’t come up with consumer protection measures for an independent Legal Services Guarantee Fund. So, the Scottish Government have basically admitted they are so stupid, have such lack of foresight, they cannot come up with an independent compensation scheme to protect consumers of legal services in Scotland under the new arrangements proposed in their own Legal Services Bill, and are therefore forced to run back to the oh-so-open arms of the Law Society of Scotland for help. Pathetic. Especially pathetic considering the Guarantee Fund is, as I reported earlier : Law Society's 'Guarantee Fund' for clients of crooked lawyers revealed as multi million pound masterpiece of claims dodging corruption. In fact, the Guarantee Fund, contrary to Mr Ewing’s understanding of reality, is in such poor state it has never guaranteed anything, and with so many reports coming into this blog of failed Guarantee Fund claims, I issued an ADVISORY for clients to protect their funds from their solicitor's dishonesty by immediately withdrawing any funds held by their solicitors. Legal insiders & law reform campaigners have all criticised the Justice Committee’s vote, along with the Scottish Government’s failure to put in place non Law Society controlled consumer compensation arrangements, rather than forcing people though the notoriously corrupt Guarantee Fund operated by the Law Society which allegedly pays out if solicitors or their staff have been ‘dishonest’. Many of those clients who attempt to claim against the Guarantee Fund usually fail, ensuring total financial loss for clients when their solicitors misappropriate funds. An official from one of Scotland’s consumer organisations, who have made many recommendations on client protection against poor or dishonest solicitors called the Justice Committee’s vote on the Guarantee Fund issue “a poor day for consumer protection against dishonest lawyers” and also went onto accuse the Scottish Government of incompetence in not coming up with independently run compensation schemes to cover the ever rising levels of dishonesty & fraud in the Scottish legal services market. Solicitor John G O’Donnell faced over 21 client claims for negligence & more of dishonesty – the Law Society worked to kill off all the claims. Don't think it could happen to you ? With solicitors & law firms running out of cash to keep their business afloat, embezzlement of client funds has become a common occurrence as the recession bites and legal business falters along with all other areas of the economy so be warned, your once friendly solicitor wont think twice about using any monies held on your behalf for their own ends and when clients eventually discover what happened to their money, a tear filled dash to the Law Society of Scotland or the Scottish Legal Complaints Commission (who after two years are still not in a position to ‘monitor’ claims to the Guarantee Fund) will not secure one penny in repayment. The Law Society are happy MSPs voted through continued Law Society control over compensation claims. Not surprisingly, the Law Society of Scotland are very happy the Scottish Government proposed their idea to force all non-lawyers & entrants into the Scottish legal services market to pay into the Society controlled Guarantee Fund, while also capping claims at a set limit of £1.25 million. The developments, have been ‘welcomed’ in the most recent media release from the Law Society of Scotland on the Legal Services Bill, where its latest President, Jamie Millar said :“We welcome the opportunity to work with the Justice Committee and the government to further discussions on the compensation fund arrangements. It’s an important and complicated issue and the Society is committed to help find a solution which will meet the needs of traditional law firms and new licensed providers and also protect consumers." The SNP controlled Scottish Government joined the Law Society and initially rejected any idea of legal services reform then, after the legal profession decided it would be better to take the issue and control it themselves, Justice Secretary Kenny MacAskill ‘changed his mind’ and the Legal Profession Bill was created, but was renamed as the Scottish Government felt it sounded more like a protectionist bill to maintain the Law Society of Scotland’s grip over access to legal services in Scotland, hence the change of title to what its present identity, the Legal Services Bill. Where are you, Which? and the OFT ? … Scots consumers are getting a raw deal here while the legal profession co opts the reforms you both asked for … how about speaking up rather than allowing the unelected Law Society of Scotland to dictate how Scots should access justice & legal services …. Scotland’s Freedom of Information Chief Kevin Dunion. SCOTLAND’s FOI COMMISSIONER Kevin Dunion has ordered the Scottish Legal Complaints Commission to release information relating to its research on the Law Society of Scotland’s notoriously corrupt Master Policy, the insurance protection scheme designed to protect the ever growing number of crooked lawyers in Scotland again claims for compensation to cover the millions of pounds of funds misappropriated from clients each year by solicitors in Scotland without recompense. A separate issue which was raised in the investigation – that of the SLCC’s poor quality redactions which led to the identification of individuals names, locations & contact information was dealt with ‘as a separate issue’ by Mr Dunion, and apparently no action was taken by Mr Dunion against the SLCC in this respect, even though individual's home addresses had been disclosed by the SLCC’s failure to properly redact several documents released under FOI. A legal insider speaking this morning on condition of anonymity dubbed the Scottish Legal Complaints Commission as ‘nothing more than a den of bitterness against those who complain about their solicitors’. Advice ? Don’t trust a regulator that hates consumers. Based on my previous articles reporting on news & consumer difficulties with the SLCC, I also would not advise any member of the public to trust the Scottish Legal Complaints Commission to investigate any complaint against a solicitor. Those who complain may well get the results of an investigation but you can bet there are so many get-out-of-jail clauses for the solicitor concerned, it wont be worth the paper its printed on. The Scottish Legal Complaints Commission is, as so many now say, nothing more than a front organisation for the Law Society of Scotland and crooked lawyers. Only fully independent regulation of legal services in Scotland will bring any protection for consumers and I urge anyone who can, to campaign for independent regulation of the legal profession – its in everyone’s interests to do so. As for Mr Smith and the others at the SLCC who apparently hate clients who dare complain about their solicitors, well, why don't you all resign and make way for people who the public can trust, instead of people who just sit there insulting everyone and keep taking the expenses & salaries cheques for doing so … what is that called again ? Scottish Parliament’s Justice Committee voted against non-lawyer ownership of law firms. INVESTORS can breathe a sigh of relief at the result of a vote at the latest Justice Committee hearing of the Scottish Government’s beleaguered Legal Services Bill, where last Tuesday, MSPs voted through an amendment written by the Law Society Scottish Government to restrict non-lawyer ownership of Scottish law firms to 49%, throwing out the Scottish Government’s initial proposals that non-lawyers could end up owning 100% of law firms if the ‘alternative business structures’ as originally proposed in the Legal Services Bill had become law. The problem with the original proposal, allowing non-lawyers to invest or even totally own a Scots law firm raised the question who would actually want to buy in to any Scottish law firm with the kind of poor regulatory & client treatment record which is so typical of providers of legal services in Scotland’s currently solicitor only dominated legal services market ? Who for instance, would want to invest in a law firm with over thirty partners which is currently facing 21 separate complaints investigations (5 of those involving embezzlement of client funds), 20 negligence claims, 9 claims against the Guarantee Fund & 2 criminal investigations ? This is certainly one vote on the Legal Services Bill which may well end up saving outside investors a lot of money, as most Scots law firms are seen as poorly performing & untrustworthy, holding among the worst rates of client complaints & consumer dissatisfaction in the modern world, where it has become more the norm than the exception for clients to be ripped off after engaging the services of even the most famous law firms in Scotland’s legal services marketplace today. Mr Ewing, you must be kidding. Regulation without expense to the taxpayer ? Even the Scottish Legal Complaints Commission received a whopping £2million from the taxpayer, effectively a public gift to the legal profession which your Ministerial colleagues now refuse to talk about or demand returned to help protect public services now on the verge of being slashed due to the UK’s budget deficit. Law Society of Scotland & Scottish Legal Complaints Commission are anti-client when regulating complaints against lawyers. Robust regulation of the legal profession in Scotland is simply not possible, as all reforms to regulation to the present date have been compromised by the Law Society and so willingly voted through by politicians in the Scottish Parliament. The new broom of the Scottish Legal Complaints Commission (SLCC) has become little more than the anti-client front organisation for the Law Society of Scotland and rogue lawyers the Law Society always wanted it to be, leaving the reforms of the LPLA (Scotland) Act 2007 firmly in the rubbish bin. The same is already happening with the Scottish Government’s plans for a ‘robust regulatory regime’ for the Legal Services Bill which has been steadily re-written by the legal profession itself. Without much surprise, the Law Society of Scotland welcomed the Justice Committee’s vote to retain Law Society member majority ownership of law firms, thus ensuring the society’s continued influence & control over consumers choice of legal services in Scotland. The Lord President Lord Hamilton is once again ‘a buffer’ between the Government & legal profession to maintain lawyers independence (from independent accountability). Mr Millar also said that the Society was pleased that the role Lord President of the Court of Session was to be enhanced and that his consent would be required in the appointment of approved regulators. He echoed the comments of Robert Brown MSP who said the role of the Lord President was an important ‘constitutional buffer’ (in other words, a well practiced drain-blocker, immovable by any means in existence) between the government and the legal profession and necessary to preserve the independence of the profession. With the dreaded inclusion of the Lord President in all of this, at the behest of the Law Society of course, lets hope the Lord President doesn’t take 40 years to come to a decision (as he did with McKenzie Friends) on whether approved regulators (the Law Society of Scotland being the only ones applying) are functioning properly or not – and since the Law Society hasn’t managed to regulate the legal profession properly in the past 60 years, we doubtless can expect a continuance of the Law Society of Scotland’s style of crooked self-regulation when or if the Legal Services Bill manages to pass into law. So, obviously the Law Society is pleased with it’s re-write of the Legal Services Bill after all that fuss & pantomime between so-called ‘factions’ of the Scots legal profession wanting to break away if they didn’t get their way … and then getting themselves elected to the Law Society’s ruling council after things went their way …. My advice to consumers ? The Legal Services Bill as it is being re-written by the Law Society of Scotland, will not benefit consumers of legal services in Scotland one bit, so much that now, some of the consumer organisations which are responsible for the Legal Services Bill’s very existence, now choose not to issue comment on the bill's progress nor have those same consumer organisations chose to campaign against any of the Law Society sponsored re-writes of the Legal Services Bill, which was initially claimed would bring free choice of legal services to consumers in Scotland. Clearly, for honest, dependable legal services, consumers are going to have to look elsewhere, as the Scottish legal profession under the regulation of the Law Society of Scotland & SLCC couldn’t be trusted with an exploded oil well, which I’m sure they would argue was nothing to do with them as similarly appears to be the case in each of the 5000 complaints & grievances filed or expressed by clients against solicitors & advocates each year in Scotland. My advice to investors looking at putting their money into Scottish law firms ? Take your investments elsewhere ! There are billions more opportunities and safer havens around the world for your money than investing in Scots law firms with poor regulator records who would much rather dance the tune of the Law Society of Scotland than give you a good, stable, dependable return on your investment. You would be well advised to avoid investing in what many corporate & private clients of Scots law firms, through their own bitter experiences of using solicitors in Scotland dub ‘the organised crime of the Scottish legal services market’. Labels: access to legal services, alternative business structures, Fergus Ewing, Law Society of Scotland, Legal Services Bill, Robert Brown, Scottish Government, Scottish Parliament, self regulation, Which? McKenzie Friends made official in Court of Session by Lord Hamilton. McKenzie Friends are officially available to all Scots court users & party litigants in the Court of Session as of today, 15 June 2010, after Lord Hamilton’s Act of Sederunt announced earlier in February of this year finally took effect, allowing anyone who cannot obtain legal representation for litigation which demands a place in Scotland’s highest court, to file a motion requesting the services of a McKenzie Friend to assist their case. McKenzie friends as we are all probably now well aware of, are lay individuals who assist party litigants in court, for example by providing moral support, helping with court documents, or giving discrete advice. The Lord President has now clarified the situation in the Court of Session through an Act of Sederunt which comes into force today. Lord Hamilton has also notified the Sheriff Court Rules Council which will consider the matter at its meeting tomorrow, 16 June 2010. This will include an acknowledgement that lay assistance to party litigants is possible; a description of what form this assistance can take; and a presumption in favour of allowing a party litigant to have such a lay assistant. A McKenzie Friend’s friend – unswerving support from Margo MacDonald MSP helped bring McKenzie Friends to Scotland’s Courts. The success of the campaign to bring McKenzie Friends to Scotland, kicked off by Petition 1247 filed by Stewart MacKenzie at the Scottish Parliament's Petitions Committee, and supported by several law reform campaigners & groups, consumer organisations such as Consumer Focus Scotland & Which?, included key support from MSPs such as Margo MacDonald & David Whitton, and even support from the original McKenzie Friend himself, Australian Barrister Ian Hanger QC, all backed up by developments during November 2009 which saw Scotland’s first civil law McKenzie Friend allowed in the Court of Session by Lord Woolman during M.Wilson v North Lanarkshire Council & others (A1628/01), was hailed today by Scottish Parliament insiders as a collective effort showing the system of public petitions had worked well, helping to bring in a reform which had also been recommended by Scotland’s Lord Justice Clerk, Lord Gill who had spent considerable time on the issue of lay representation as part of the two year Civil Courts Review. Whilst I would characterise the year long campaign to bring McKenzie Friends to Scotland as being more of a struggle between the Lord President, the Scottish Parliament, the Scottish Government and supporters, there is no doubt a reform which featured heavily in Lord Gill’s Civil Courts Review has made it to existence much sooner than if things had been left to the courts system itself to allow. After all, Scotland has been without McKenzie Friends for forty years, an omission no one is yet willing to explain substantively, and apparently an issue the Petitions Committee feels it cannot seek answers to. 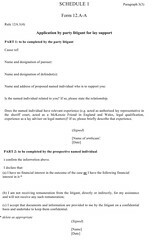 Application for a McKenzie Friend in the Court of Session will cost £45. There are also some questions remaining over access, costs & funding of McKenzie Friends in Scottish Courts after the Court of Session Rules Council minutes revealed some ‘devil in the detail’, most notably on fees(proposed by the Lord President to stand at £45 per motion for a McKenzie Friend), which have been sharply criticised by some as party litigants are often unrepresented and have been put in a position of being a party litigant more because they cannot afford the expensive legal services of Scotland’s legal profession rather than the constant argument from the Law Society of Scotland that their cases are not worthy of courtroom attention. Given the costs of travel to the Court of Session and other associated costs, it is hoped the £45 fee may be looked at in a sympathetic light as applications for McKenzie Friends being to reach the Court of Session. While Scots will be stuck with the £45 fee for the time being, fees for applications of McKenzie Friends/lay assistance in the English family courts (pdf) apparently stand at £175, using the Application Form C2 (pdf). However, party litigants have been able to circumvent the fees by writing to the judge enclosing the CV of their intended McKenzie Friend, according to individuals well experienced in the McKenzie Friend process in the English courts. The Scottish Government have lodged a promised amendment to the Legal Services Bill proposing McKenzie Friends with a right to address the court. While questions remaining over the use of McKenzie Friends (Lay Assistants) in Scotland’s Sheriff Courts will be answered at tomorrow’s Sheriff Court Rules Council meeting, chaired by Lord Hamilton himself, another benefit has emerged from the successful introduction of McKenzie Friends to Scotland’s Court of Session .. in the form of a recent amendment lodged by the Scottish Government to the Legal Services Bill, which proposes to allow Lord Gill’s Civil Courts Review recommendation of a ‘super’ McKenzie Friend with a right of audience, who will be able to address the court as well as assist their party litigant with all the other tasks associated with a McKenzie Friend up to now. A Scottish Government spokeswoman said: "We have lodged amendments to the Legal Services (Scotland) Bill to allow provision for lay representatives, who do not have a right of audience, to address the court on behalf of a party litigant, in certain circumstances." So, compliments to the Scottish Government on this one … the first recommendation of Lord Gill’s Civil Courts Review to hit the streets in a usable form for court users in Scotland’s civil justice system. Lets have more please, including the reforms suggested by Lord Gill on Class Actions and also digital recordings in court which many would welcome being implemented in the present rather than far in the future. I reported on the issue of transcripts of proceedings in Scotland’s courts in an earlier article here : Scottish court users advised to 'take along a note taker' as omissions in civil court transcripts jeopardise consumers access to justice and clearly Lord Gill feels the matter of digital recording facilities in Scotland’s courts would assist the interests of justice, confirmed to me by many litigants involved in civil actions where the events which took place in court are often omitted from interlocutors and later references made by opposing legal teams. While there is still some work to do on McKenzie Friends in Scotland, to ensure Scots have the same entitlements as our English cousins, I would like to thank all involved who have cooperated in my series of reports on McKenzie Friends over the past year, thanks going especially to the original McKenzie Friend, QC Ian Hanger, MSPs such as Margo MaDonald and David Whitton, and the many officials from the Scottish Court Service, Scottish Government Scottish Parliament and others who have spoken out when it counted, or given statements to complete my coverage. The Petitions Committee of the Scottish Parliament will again discuss Petition 1247 later in the summer. Complaints against lawyers in Scotland ‘are whitewashed’ without media coverage. MEMBERS OF THE PUBLIC who are forced to complain about their solicitors were today reminded by consumer groups & law reform campaigners their complaints to the Law Society of Scotland and ‘anti-client’ Scottish Legal Complaints Commission, especially complaints involving the most serious issues such as fraud, embezzlement, theft, mishandling of wills etc.. stand a much better chance of being more thoroughly investigated if the media become involved and the case is well publicised, after a string of reports exposing crooked lawyers in the national media were reported to have helped along complaints made by clients of Scottish solicitors while also helping other members of the public fall victim to the same rogue lawyers. Would you use a lawyer who stole £4million ? The Law Society did nothing until the media exposed the crooked lawyer. 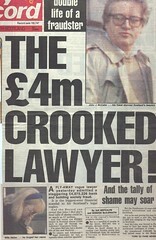 The publicity of naming & shaming ‘crooked lawyers’ – which has become common knowledge among many Scots who have been forced to deal with the extremely prejudiced anti-client complaints system operated by both the Law Society of Scotland and now the hapless Scottish Legal Complaints Commission has been held up as an example by consumer officials for all clients who register complaints against their solicitors or law firms, in the firm belief based on firm evidence that media interest in complaints against solicitors speeds up investigations against ‘crooked lawyers’ while also drawing attention to the endemic problems of corruption within Scotland’s legal profession, and the legal profession’s unwillingness to regulate its own members unless headline grabbing stories begin to appear in the national or online media. 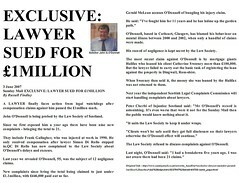 Banned solicitor John G.O’Donnell is one of many lawyers in Scotland facing multiple negligence claims – would you use such a lawyer the Law Society seeks to protect ? 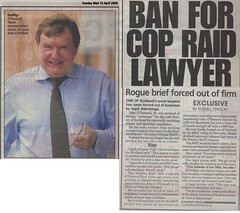 After continual media coverage relating to the case of the banned-for-now solicitor John G. O’Donnell, which revealed more of the lurid world of Scottish legal regulators & major insurers conspiring to prolong & defeat financial claims made by ruined clients against hundreds of crooked lawyers still allowed to practice in Scotland, an official from one of Scotland’s consumer organisations today urged anyone who has registered a complaint against their lawyer with the Law Society of Scotland or Scottish Legal Complaints Commission to come forward to the national media and publicise the details of their complaints, to protect themselves from any prejudice the legal profession show against investigating their complaint, and help protect others from falling victim to the same fate. Frauds against wills & executry estates are a favourite targets for lawyers who often get away with stealing from deceased clients after a Law Society ‘complaints whitewash’. A client whose complaint against his family lawyer has been with the Law Society for over two years with as yet no action after over £100,000 had gone missing from the client’s late mother’s will said the only way to get some justice against lawyers who steal is to go public and keep the pressure on the lawyer and the Law Society to do something. An individual who was formerly employed by an independent regulator of complaints against solicitors said he welcomed the call for members of the public to publicise their complaints against solicitors. He continued : “Fully independent regulation of solicitors will only come with a steady stream of media attention to the issue highlighting the sheer numbers & similar types of complaints made by clients against identifiable solicitors & law firms. The Law Society & SLCC know this to be the case which is why both keep a lid of confidentiality on all complaints they receive. Even complaints which involve criminal allegations of a sexual nature against solicitors are buried by the legal profession unless media attention ensues. As media reports have already revealed, complaints or scandals involving members of the legal profession are not limited to financial matters as revelations of some complaints to the Law Society show members of the public have been forced to complain against inappropriate conduct of their solicitors, where in one shocking instance now coming to light, a married solicitor & father of two began pestering the young son of a client to attend clandestine meetings with a sexual intent. 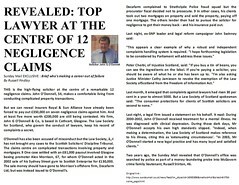 In this particular case, as yet unreported in the media, it appears the allegations have not been reported to the authorities by the Law Society, even though the solicitor concerned - a ‘leading partner’ in a famous Scottish law firm used by many of Scotland’s top businessmen, has faced similar allegations in the past of seeking inappropriate contact with children. Media exposure of the Law Society’s efforts to protect crooked Kelso solicitor Andrew Penman led to long road to reform of complaints against Scottish solicitors. Admittedly in some cases, media coverage can take years to have any effect on a case, where in my own particular complaint, the Scotsman’s (of old) exposure of the Law Society of Scotland’s efforts to protect crooked Borders lawyer Andrew Penman of Stormonth Darling Solicitors, Kelso from a prosecution before the Scottish Solicitors Discipline Tribunal, eventually led to many reforms of regulation of complaints against solicitors in Scotland. Law Society Council member James Ness prevented SSDT prosecution of Andrew Penman. While the media coverage in my own case did not change the Law Society’s cover up of the Penman case, nor did it resolve the issue of the senior Law Society Council members who halted the prosecution of Mr Penman before the Discipline Tribunal on everything from deceiving the Inland Revenue to Banks, the publicity on Andrew Penman & Stormonth Darling helped publicise many other serious complaints against rogue lawyers in Scotland, also helping a few members of the public to avoid publicly identified lawyers & law firms associated with complaints & corrupt practices, a lesson which should be learned by all. 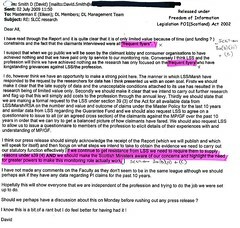 Justice Secretary Kenny MacAskill compromised SLCC & legislative reforms to complaints against solicitors. Lessons on reforming complaints against solicitors must also be learned, after witnessing the mess of the Legal Profession & Legal Aid (Scotland) Act, considered by the Scottish Parliament in the summer of 2006, and eventually passed at the end of that year. The regulatory aims & reforms of the LPLA Act sadly now lie in dust, after the SNP minority administration which came into existence in May 2007, completely compromised most of the planned reforms of the LPLA Act, with the Justice Secretary, Kenny MacAskill going onto appoint Law Society stooges to what was to have been an independent Scottish Legal Complaints Commission. The SLCC as we all now know, has turned into little more than an anti-client front company for the Law Society itself, demonstrating well that lawyers cannot be involved in regulatory role against themselves in the future if reforms to regulation are to succeed in giving the public unrivalled consumer protection from Scotland’s notoriously poor legal services sector. The Scottish Government are planning to approve the Law Society to continue regulating complaints in the new Legal Services Bill. Despite the infamous history of corrupt self regulation of the legal profession in Scotland, where lawyers have covered up for lawyers for decades, the Scottish Government are planning to allow the Law Society of Scotland as an ‘approved regulator’ to oversee complaints against even non-lawyers in Scotland’s ‘expanded’ legal services market to be ushered in after the passage of the Legal Services Bill, once aimed at expanding access to justice in Scotland but now viewed as little more than a bill aimed at consolidating the legal profession’s grip on Scots access to legal services. Such plans will only increase the cover ups associated with lawyers regulating themselves, while it is likely the non-lawyers will face more harsh treatment in an attempt by the legal profession to quash any competition in the legal services sector. So to all those seeking advice on whether it would be best to publish your complaints against your solicitors before going to the Law Society of Scotland & Scottish Legal Complaints Commission, the answer is a firm YES .. however, if you do, seek out a newspaper with a decent circulation who will investigate and report on the story. If readers want recommendations on which newspaper to approach, please ask questions in the comments section. Remember readers, wider publication of your complaint against your solicitor will help the progress of your own complaint as well as help to prevent others from falling victim to the same actions taken against you by your own solicitor, who may well have done the same to many other clients ... You can all help end the cycle of 'crooked lawyers, crooked self regulation' by wider publication of complaints against solicitors. Community Safety Minister Fergus Ewing announces regulation for non-lawyer will writers. FERGUS EWING, the Scottish Government’s Community Safety Minister standing in for the Justice Secretary Kenny MacAskill announced the latest round of amendments to the Legal Services (Scotland) Bill which include the regulation of non-lawyer will writers in Scotland, some of whom have been targeting people with the same sharp practices so often employed by solicitors & law firms who, as the complaints statistics reflect, still represent the greatest threat to deceased clients wills & executry estates. However, there is a deadly twist in the plans announced by the Scottish Government, which may well end up ensuring any non-lawyer will writing services and indeed any new entrants to Scotland’s legal services market, are regulated by the Law Society of Scotland, as no other regulatory bodies have indicated they intend apply to Scottish Ministers to be ‘approved regulators’ for the expanded legal services market which the Legal Services (Scotland) Bill is designed to reform, aiming to bringing wider access to justice for Scots consumers of legal services, many of which are currently available through solicitor members of the Law Society of Scotland. Accountants regulator ICAS had intended to apply as an ‘approved regulator’ although the Law Society are now viewed as the ‘favoured applicant’ by Scottish Ministers. Initially the Institute of Chartered Accountants of Scotland (ICAS) had announced they were considering making a bid to become an ‘approved’ regulator in the reformed legal services market, however ICAS have not updated their position on the issue, and with the dithering, anti-client Scottish Legal Complaints Commission also undecided about whether it will apply to the Scottish Government as an ‘approved regulator’ of legal services, the only contender for regulating any new entrants to Scotland’s currently solicitor only legal services sector is the Law Society itself, leaving the possibility the infamous solicitor’s self regulator may well use its dominant position to force out new entrants to the legal services market it may see as competition to its own solicitor members. As I am in favour of regulating non-lawyer will writers, I have no huge problems with the Scottish Government’s proposals, however the fact nothing has been done to protect the public from the Law Society of Scotland’s poor regulation of solicitors & law firms who in many cases, deliberately mishandle a deceased client’s estate simply to ramp up their own firm’s profits & personal finance deals with some of the major High Street banks on the back of assets of deceased clients, means there is still effectively no protection for Scots consumers when it comes to wills & executries. Allowing the Law Society to regulate the entire wills & executries sector where the Law Society has already proved it cannot regulate its own member’s conduct on handling wills & the assets of deceased clients, will not improve consumer protection nor help reduce the huge amount of will fraud in Scotland, whether such frauds are committed by lawyers, or non-lawyers. "The regulation will continue to allow non-lawyers to provide a will writing service, but will protect consumers by ensuring that such will writers are subject to robust regulatory rules, enforcement measures and sanctions. However, we will not regulate individuals preparing their own will, with or without a DIY pack, including "deathbed" wills, or other persons providing a free advice service." The Scottish Government consultation on the regulation of non-lawyer will writers took place between December 18, 2009 and February 19, 2010. The consultation paper sought views on the possible regulation of non-lawyer will writers in Scotland. 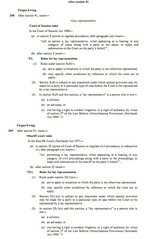 The Legal Services (Scotland) Bill ("the Bill"), which was introduced in the Scottish Parliament on September 30, 2009, provides a legislative vehicle to provide for regulation of non-lawyer will writer services in Scotland. Following representations made to it, the Scottish Government is concerned that some non-lawyer will writers may be exploiting the lack of regulation to the detriment of the consumer in Scotland. The consultation responses indicated that there is almost overwhelming support for regulation of non-lawyer will writers amongst the respondents. Indeed, 45 out of the 48 respondents are in favour of such regulation. As to the method of regulation, the vast majority of respondents are in favour of using the same model as outlined in Part 3 of the Bill. The regulation will continue to allow non-lawyers to provide a will writing service, but, at the same time, will protect consumers, by providing a set of regulatory rules, enforcement measures and sanctions that would apply to such non-lawyers. It is not the aim to regulate individuals preparing their own will, with or without a DIY pack, including "deathbed" wills, or other persons providing a free advice service. Since members of the public are currently not protected from solicitors mishandling wills, nor are clients getting good advice from solicitors at reasonable costs, how would allowing the Law Society to regulate non-lawyers improve consumer protection ? The answer is clearly it wouldn't, but it would of course, maintain the Law Society’s power base and hold over the Scottish legal services market, which the Law Society is clearly intent on holding onto, at whatever cost. As far as the individual instances of poor practice listed by the Scottish Government in their press release are concerned, most or all of the instances quoted in reference to non-lawyer will writers also apply to the services of a solicitor, which begs the question why the Scottish Government are content for the Law Society of Scotland to poorly regulate thousands of complaints about solicitors mishandling wills & estates, while introducing new regulation to oversee non-lawyer will writers. Poor knowledge of inheritance tax – again, another rampant issue in the legal profession, and speaking from experience in the case of Borders solicitor Andrew Penman, of Stormonth Darling solicitors Kelso, who ignored up to eleven letters from the Inland Revenue on inheritance tax, prompting the Inland Revenue to contact me directly, well … what more needs to be said ? Low advertised costs translating into substantial fees through bait and switch and tying in of other services –The same happens in a solicitors office when it comes to dealing with a will. Just watch how quickly huge overdraft accounts are opened on a deceased’s client’s estate with the solicitor’s bank, gaining the solicitor cheap personal finance deals using the deceased’s client’s assets as cover in what is one of the most common ‘scams’ known in executry work. Lack of Professional Indemnity Insurance – which solicitors do have, in terms of the Master Insurance Policy, run by the US owned insurers Marsh, who pled guilty to fraud & bid rigging criminal charges in the USA along with Royal Sun Alliance on behalf of the Law Society of Scotland. However, the Master Policy hardly ever pays out, and if victims of solicitor will fraud try and make a claim against either the Master Policy for negligence, or the equally corrupt “Guarantee Fund” compensation scheme run by the Law Society, sheer hell is unleashed, making sure claims fail on a routine basis. Poor storage of wills – indeed, I could write about hundreds of solicitors who are or have been the subject of complaints to the Law Society where original wills have went missing, to be replaced with doctored versions giving intricate & costly duties to the solicitor never intended by the deceased client, and in some bizarre cases, even leaving legacies to the solicitors themselves. Reprinted from my earlier report are a few examples of solicitors defrauding wills & executry estates, which it appears the Scottish Government are still content to allow by leaving regulation of lawyers in the hands of lawyers, and thus denying the Scots public the total consumer protection of fully independent regulation of legal services in Scotland. 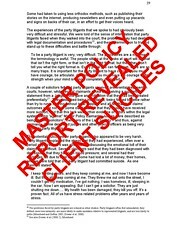 Solicitor ripped off dead client & family, paid huge interest to his own Bank. An elderly man recently deceased had left his home, possessions & sizeable investments to his wife & family in what he obviously thought was a simple straight forward will, making the mistake of appointing his solicitor as his executor. The first thing the solicitor did was open up three overdraft accounts with a local High Street bank which coincidentally, the solicitor also deals with on a business & personal basis. Over the three years the solicitor took to process his deceased client's estate, the High Street Bank received a staggering £27,000 in interest alone on the overdraft accounts, despite there being no debts on the deceased’s estate. Documents also now reveal the solicitor negotiated some cheap personal finance from the same High Street bank to purchase a second home. The widow of the deceased, upon being told the investments in the will had been cut in value by three quarters, made a complaint to the Law Society of Scotland after discovering through careful investigation her late husband's investments had been changed around by the solicitor at his own discretion rather than being realised and handed over to the family as per the instructions contained in the will. Now the Law Society have backed the solicitor against the family, despite a £250,000 loss being incurred in the late husband's investments, together with the loss of title deeds to the home in which the widow still lives, while it seems the solicitor has experienced a remarkable increase in his own personal wealth, along with 3 recent top of the range cars. Solicitor & accountant ripped off client’s charitable donations via her will. The result of the charitable intentions of a deceased elderly nurse who bequeathed her substantial entire savings including her house, in total valued at over £2 million to charitable causes, has so far resulted in not one of her wishes being respected by the solicitor and a long time friend, an accountant, she made executors of her will. Charities who were named in the initial will have, after two years, yet to receive a penny, while again, a local High Street Bank has received over £18,000 in interest on several overdraft accounts opened by the solicitor allegedly to pay debts on the estate which never existed. Meanwhile the solicitor has also bought himself a second house, as has the deceased's' long time friend' the accountant, and the charities who were due to receive sums of money are now questioning whether they will receive anything, given a recent letter to one charity from the solicitor suggesting "there was little left in the estate to cover the charitable bequests" - this despite the fact the nurse had no debts whatsoever, and owned her own home. 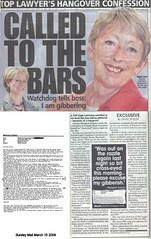 The paralegal who brought this case to the attention of Law Society of Scotland has been sacked from solicitor’s law firm, and since there is no one to independently monitor how the solicitor and accountant, both acting as executor, have so fraudulently mishandled the estate of their client (and victim) nothing will probably be done against those who have so obviously plundered the estate of their dead client. Even the charities themselves are apparently reluctant to make a complaint to the Law Society of Scotland, possibly because a fleet of solicitors wives and family relatives sit on one of the charities concerned. Solicitor stole 400k from will, no action by Law Society. A solicitor named as executor in an estate of an elderly unmarried man who had no surviving family, dying three years ago, tore up the original will of his client, and replaced it with one he had created to cover up the fact that a whopping £400,000 has disappeared from his deceased client's bank accounts. The will, which left a substantial bequest to a care home managed by the deceased's local authority, has also seen the usual huge payments of interest fees to a local High Street Bank, in one case alone of £14,000 of pure interest, the same bank handling the solicitor's law firm accounts. The local authority had questioned when the bequest was to be made over to them, after being told by the solicitor there was little left to pay out his client’s wishes. The Law Society are supposedly still looking into the case, with as yet no action against the solicitor concerned. Solicitor acting as executor stole over £30,000 from children’s trust. A deceased soldier who appointed his lawyer as executor, leaving everything to his wife & children, has unwittingly placed his family in the position of having to endure sickening refusals by the legal profession to do anything to recover over £30,000 of investments which were placed in a trust by the deceased client, for his children. The solicitor, acting as executor, cashed in the trust and used it to pay off gambling debts which everyone including the Law Society is now trying cover up.